Women simply adore Alber Elbaz (and by extension, Lanvin) owing to his love and appreciation of real women: sans the plastic or pretension. It was an absolute dream to spend Monday morning with him – quite candidly my favorite designer of our era – and Mr. Mickey exploring the showstopping Lanvin Spring 2009 collection (with a few previously unseen Cruise 2009 gems thrown in for good measure)! As per usual, comfort was of cardinal priority throughout the design process. Even the seemingly 'structured' garments felt lighter than a feather on the skin: a truly remarkable feat bearing in mind the weighty heft of similarly shaped Giambattista Valli frocks. About 70% of the bags were entirely vegan – perhaps stemming from his dear kinship with fellow Israeli Natalie Portman or a reworking of F/W 2008's cruelty-free (by default) ribbon motif – the most electrifying of which sprang from Spring 2009's interludes of vibrant leopards, insane new crystal studded versions of last season's cult shapes, and Cruise 2009's Elbaz-doodled beach totes with PVC handles. If you're in Gotham Tuesday or Wednesday be sure to stop by Barney's 2nd floor on Madison & 61st. See invitation [above] for details. 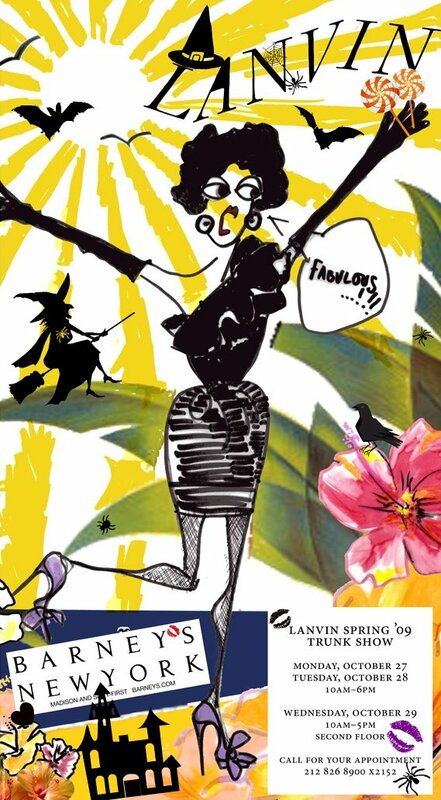 To my knowledge Alber will not be in store again – but his all-embracing, voluptuous, fresh-from-the-runway frocks will! *Total major coincidence: many thanks to Tim Blanks (brilliant host of the style.com videos, including the one at top) for helping me find the then-new black Lanvin bag lost in the kerfuffle of Ikram's annual post-McQueen Indian fête. By now that bag must be on its ninth life! I met Alber last year at Saks while he was doing a signing and wore a tee shirt that I made in my silkscreen class that said "Rub on my tat tats Alber Elbaz" which he LOVED, had his assistant take a photo of us together for himself, and signed it! All without me asking him to do so. One of the sweetest men I've ever had the pleasure of meeting. Great combination of pieces on a true gentleman!